Sunday I had some fun planned. It started out with body flow. I was happy to get back to my Sunday routine. I didn’t get as much sleep as the night before, so I was definitely yawning my way through class, but I was feeling the burn. The new release is no joke, but I can feel myself getting stronger and my balance getting better. I used to fall over all the time, but slowly I’ve gotten better and can sometimes make it through a sequence without having to put my foot down. 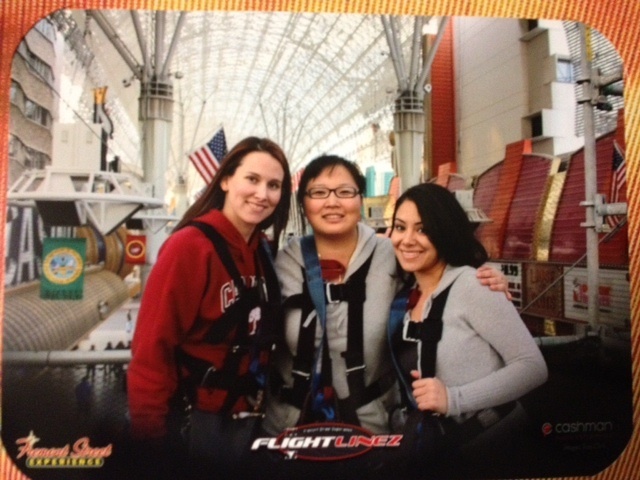 For the afternoon I had much more exciting plans, heading to downtown Las Vegas to Fremont Street to zip line with my friends, Vivian and Yara. 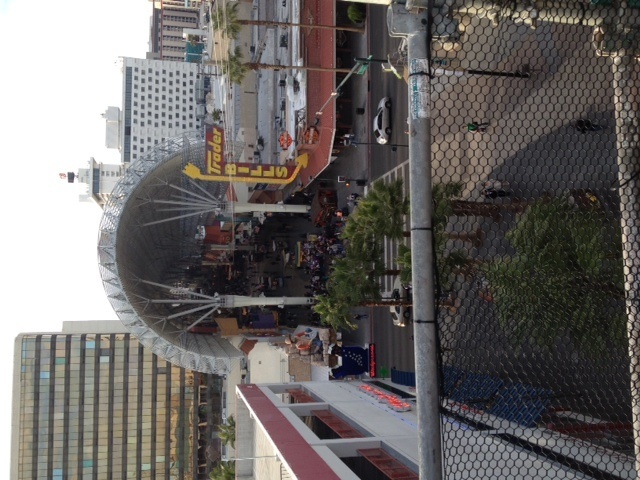 There are 4 zip lines that run along the Fremont Street Experience. Before 6 pm it’s only $15, or 2 rides for $20. Of course we had to do the 2 rides. We waited in line for not too long. So I’m kind of afraid of heights, okay not kind of, I am afraid of heights. 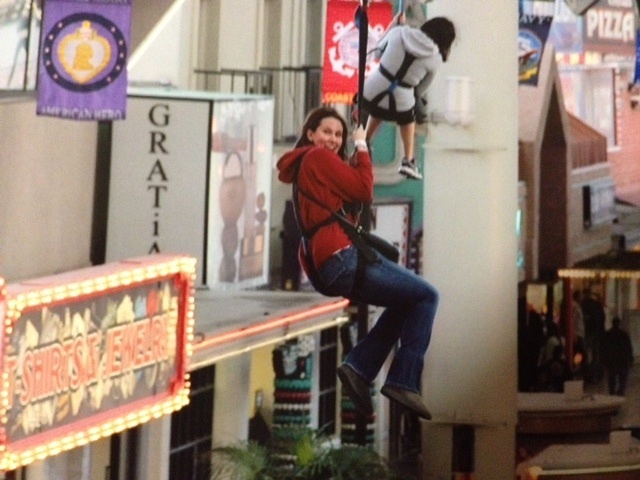 My palms got all clammy and I was definitely nervous, but the guy strapped me in and off we went. I may or may not have screamed the entire way as we flew over lots of people on Fremont Street, there may be pictures to prove it and then I did it all over again. It was soo soo much fun, I think I would do it over and over again. I’m still scared of heights, but there’s nothing like flying. The one thing I could do without would be the harness hurting certain areas and we’ll leave it at that. 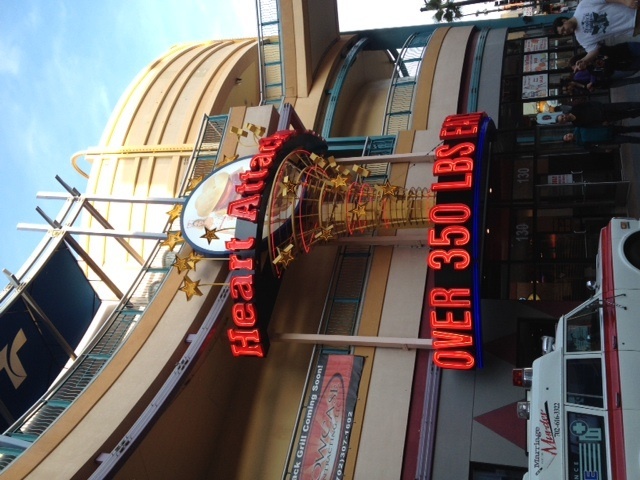 After flying over Fremont Street twice we headed to the Heart Attack Grill. I had high hopes for getting some bacon cheese fries, because with a name like heart attack grill you should have bacon cheese fries right? WRONG! The only items on their menu: fries, burgers of varying sizes of hugeness and milk shakes. 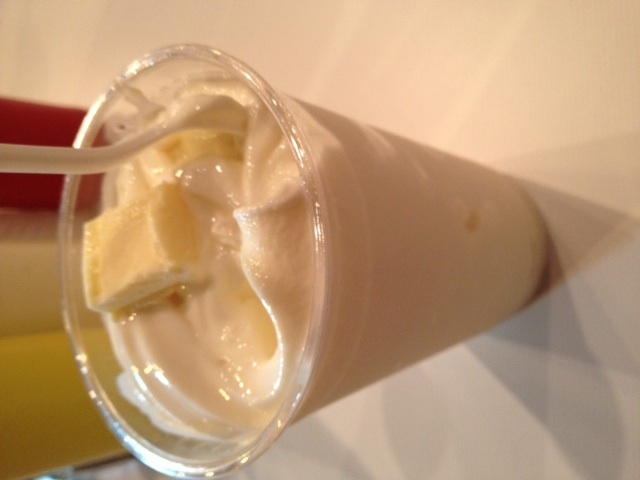 The milk shakes are made with butter and cream and taste like legit butter. I’ve never felt so disgusting having a milkshake. I think I had four bites (yes bites, it was that thick) before giving up. The waitresses are dressed like nurses and you wear a hospital gown. If you weigh over 350lbs you eat for free. This place is the picture of healthy living. Good thing I went for a run after work today, because it will take weeks of working out to burn off the calories in the 4 bites of milkshake. I’m committing myself to fitness the week. I’m at 3 days in a row. I’m taking tomorrow off to have dinner with my bff, Katie and check out her new ride! but it’s back at it on Wednesday. I want to work out at least 5 days this week, if not more. Zip lining sounds like lots of fun! Glad you didn’t let your fear of heights hold you back and make you miss out on something so fun. Heart Attack Grill was so gross! ugh, never again! but zip lining was sooo fun!